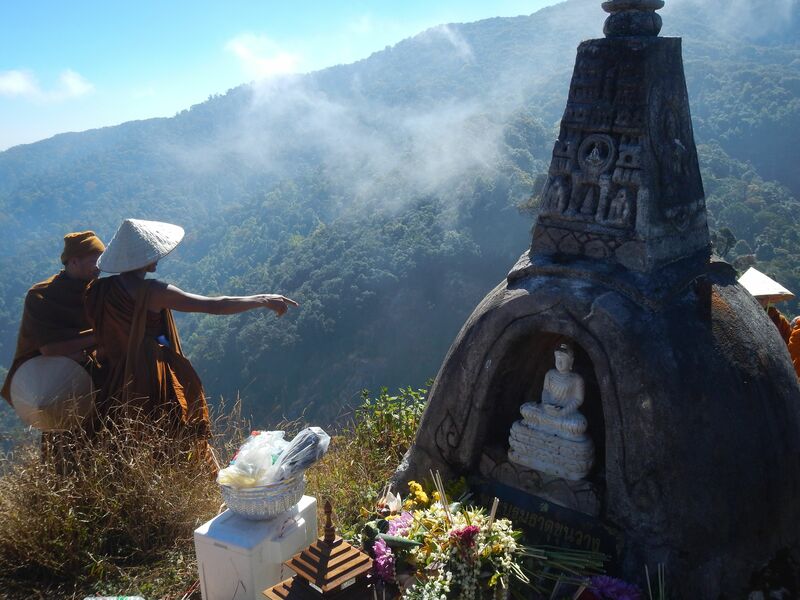 On January 3rd, all the volunteers, guests, and then some joined the countryside pilgrimage up to a mountain shrine. We set off around 6:45 to take part in this New Year’s tradition. The sun opened its red eye through the morning haze as 15 of us pushed up the mountain packed into the cabs and backs of two trucks. A mountain chill kept everyone wrapped in blankets or jackets. When we arrived at a Royal Project site about an hour later, muscles were eager to be stretched in the sun that was beginning to reach out to warm us. Scattered all around the site, more ambitious folks than us were bustling among a myriad of tents and stoves. A pack lunch was handed out to everyone and we soon set off, somewhere near the end of a long line of travelers, all starting when they felt like it. The hike itself was no walk in the park. Starting with a moderate slope through sloping gardens, the trail soon entered the jungle. The path snaked its way past a towering vine encased tree and then steepened up towards the peak. Rarely, a bamboo rail would aid our leg muscles on a particularly sharp incline, but for most of the journey, we had to rely on internal perseverance alone. The folks walking along included rambunctious boys scurrying past adults, weathered monks robed in orange and stepping with a persistent metronome pace, us foreigners laboring through with our hiking boots, and even a man blazing down the trail in bare feet. When anyone stopped for a quick rest, they were never alone or hungry. Inquiries to health were made in Thai and English and oranges or hard boiled eggs from the lunch goody bag were offered as soon as a breath sounded a bit too ragged. This was a group event, and everyone intended to make sure all made it to the final destination. And what a destination it was. When we finally reached the monolithic peak (about three hours total and one false summit later), it was well worth the aching calves. Located just across from Doi In Thanon, there are two pillars of rock that shoot up into the mountain air. On the northern one, hundreds of people gathered near a small stone shrine. Everyone took in the place as they saw fit. Young daredevils scampered across a thin bridge to the other pillar. Monks perched like statues on ledges to meditate in the clean air. Everyone ate and reveled in the beauty with each other. Some prayed, some laughed, and some even snored. All around was open air leading to neighboring mountains and farther out, only a mist that shrouded whatever lay beyond. Clouds and smoke from incense rushed below, above, and through all of the pilgrims. Removed from the world below, we were left to simply be. Eventually, one by one, people and groups pulled themselves away when they felt the time was right. Legs moved faster on the way down. Back at the Royal Project site, there was food aplenty for the weary travelers. Noodles, oranges, ginger tea, waffles, and oranges were doled out to any who wanted to eat. The lush green lawns of the garden made for excellent temporary beds until we piled back into the trucks to head down. The warm golden sun made for a sleepy ride back for some, and in the late afternoon we pulled back into the farm pleasantly tired and ready for a new year to begin. Categories: village life | Permalink.